Project Description: The state of the art facility serves the training needs of regional public safety professionals and students in emergency services, fire protection, and criminal justice in the Willamette Valley. The training facility consists of a classroom and office building, a burn tower, a technical rescue tower, a low speed driving course, and LPG props, logistics building, confined space rescue maze, and a training pond. Westech Engineering worked closely with the college and the design team to complete the site design as well as the design for the widening of Brooklake Road. 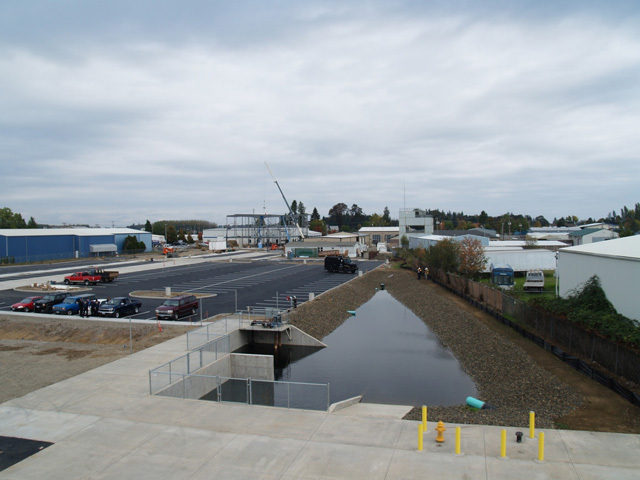 Some unique design elements of the project included the existing community water system, a STEP wastewater collection and disposal system, and a multiuse pond and stormwater treatment facility. The multiuse pond not only provides water for the training exercises but also serves as the required fire fighting storage water and detention facility for the site. Additional detention and stormwater quality treatment is also carried out in a long bioswale that flows through the site.